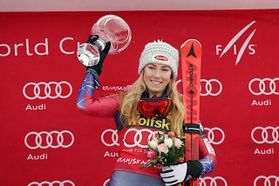 Everything seems to be in her favor, however… Mikaela Shiffrin has won last three slalom races, she took the podium 23 times at 24 races, she is a winner of 2017 Maribor slalom race and she won in Podkoren today. However, Swiss Wendy Holdener in getting closer and closer with 13 podium rankings, but still with no victories. Slovakian Vlhova could interfere in tomorrow's Shiffrin vs. Holdener duel. Our Ana Bucik will experience performing in the lead- group for the first time. Organizers prepared an excellent racecourse complimented by all top ranked racers, promising a very exciting Golden Fox slalom race at Vitranc tomorrow. Six Slovenian racers will compete.